American diplomat and journalist; born at Columbia, S. C., 1818; died in 1891; brother of David Camden de Leon. His father, a physician, removed to Columbia, S. C., and was mayor of that city for several years. De Leon graduated from South Carolina College and studied law, but soon turned to literature and politics. He became an active collaborator on the "Southern Review," the "Magnolia," the "Southern Literary Messenger," and other periodicals. 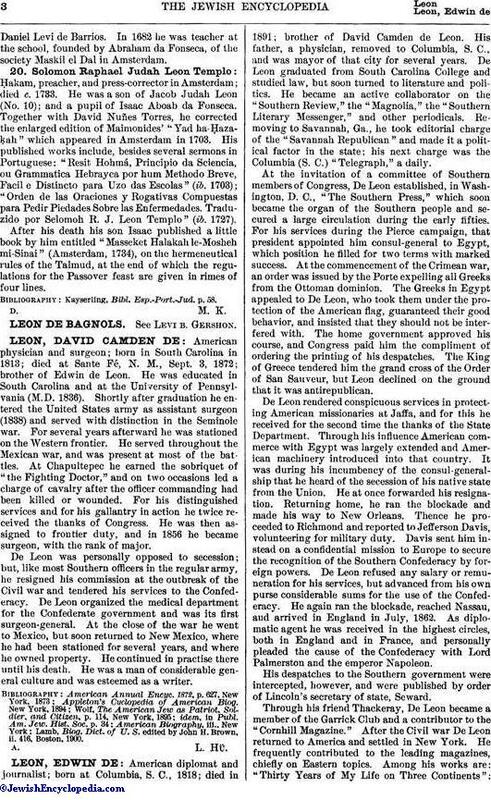 Removing to Savannah, Ga., he took editorial charge of the "Savannah Republican" and made it a political factor in the state; his next charge was the Columbia (S. C.) "Telegraph," a daily. At the invitation of a committee of Southern members of Congress, De Leon established, in Washington, D. C., "The Southern Press," which soon became the organ of the Southern people and secured a large circulation during the early fifties. For his services during the Pierce campaign, that president appointed him consul-general to Egypt, which position he filled for two terms with marked success. At the commencement of the Crimean war, an order was issued by the Porte expelling all Greeks from the Ottoman dominion. The Greeks in Egypt appealed to De Leon, who took them under the protection of the American flag, guaranteed their good behavior, and insisted that they should not be interfered with. The home government approved his course, and Congress paid him the compliment of ordering the printing of his despatches. The King of Greece tendered him the grand cross of the Order of San Sauveur, but Leon declined on the ground that it was antirepublican. 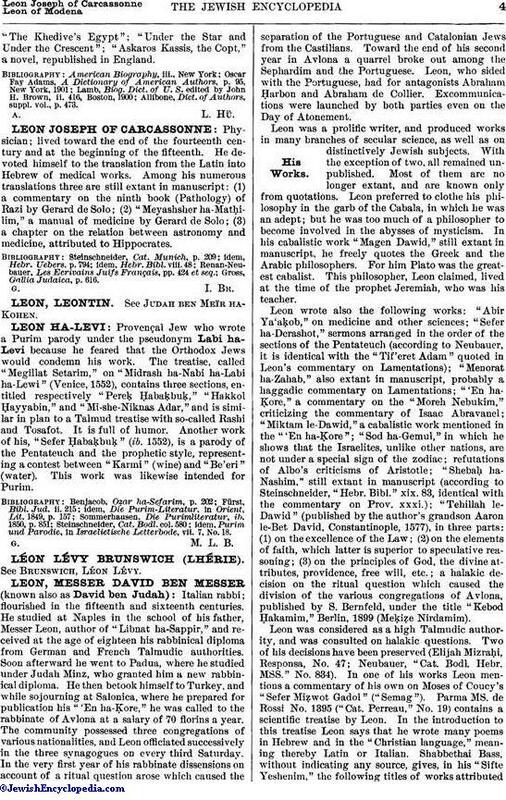 De Leon rendered conspicuous services in protecting American missionaries at Jaffa, and for this he received for the second time the thanks of the State Department. Through his influence American commerce with Egypt was largely extended and American machinery introduced into that country. It was during his incumbency of the consul-general-ship that he heard of the secession of his native state from the Union. He at once forwarded his resignation. Returning home, he ran the blockade and made his way to New Orleans. Thence he proceeded to Richmond and reported to Jefferson Davis, volunteering for military duty. Davis sent him instead on a confidential mission to Europe to secure the recognition of the Southern Confederacy by foreign powers. De Leon refused any salary or remuneration for his services, but advanced from his own purse considerable sums for the use of the Confederacy. He again ran the blockade, reached Nassau, and arrived in England in July, 1862. As diplomatic agent he was received in the highest circles, both in England and in France, and personally pleaded the cause of the Confederacy with Lord Palmerston and the emperor Napoleon. His despatches to the Southern government were intercepted, however, and were published by order of Lincoln's secretary of state, Seward. Through his friend Thackeray, De Leon became a member of the Garrick Club and a contributor to the "Cornhill Magazine." After the Civil war De Leon returned to America and settled in New York. He frequently contributed to the leading magazines, chiefly on Eastern topics. Among his works are: "Thirty Years of My Life on Three Continents";"The Khedive's Egypt"; "Under the Star and Under the Crescent"; "Askaros Kassis, the Copt," a novel, republished in England. Allibone, Dict. of Authors, suppl. vol., p. 473.